Home. That one simple word conjures up loads and loads of memories, doesn’t it? Especially during the holiday season. It brings comforting thoughts of family and friends, warm smiles and laughter, and meals shared around the kitchen table. Or before a warm fire on a chilly evening. All things that our brave servicemen and women forgo as they serve away from home. This fall, Marie Callender’s is gearing up to re-launch the Comforts from Home Project by bringing the comforts of home to those who protect America’s homes every day. By visiting www.ComfortsfromHome.com, you can join Marie’s in helping to bring a little bit of home sweet home to our those serving overseas. Marie’s is also teaming up with the USO to support USO Operation Celebration™, a program that shares a bit of home with our troops and helps them celebrate the holidays year round. Marie’s also knows that life can often take our loved ones far from home and away from all of the comforts and happiness it brings. The Comforts From Home Project is dedicated to bringing the heartwarming feelings, flavors, and favorites of home to those who miss it most. Every time you visit the Comforts of Home web site and enter a code from a specially marked package of Marie Callender’s meals or desserts, Marie’s will make a donation to USO Operation Celebration™, a program that ensures that our troops have a chance to celebrate every holiday. The more you participate, the more the USO and Marie’s can help give our military personnel a bit of the Comforts of Home! In our household, one of the ways we find comfort is through cooking and sharing food with family. And during cold weather, one of the most comforting meals we enjoy is soup or stew. Even better if there’s a fire going and we can sit together enjoying the flames while we dine. This Shrimp and Corn Chowder is very quick to make, delicious, and quite satisfying. I hope you’ll try it the next time you need a little Comfort from Home. Cut the bacon crosswise into 1/2-inch pieces. Add to a large saucepan over medium heat and cook until browned and crisp. Remove the bacon and set aside. Keep the bacon drippings in the pan. 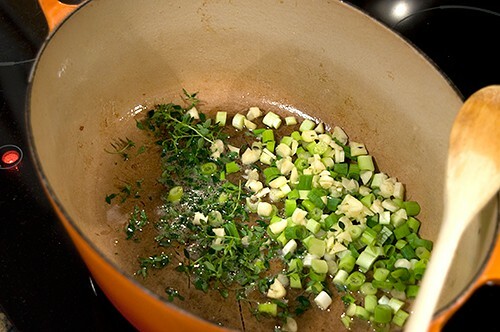 To the bacon drippings, add the green onions, thyme, and garlic. Cook, stirring frequently, until the onions are wilted (approximately 2 minutes). 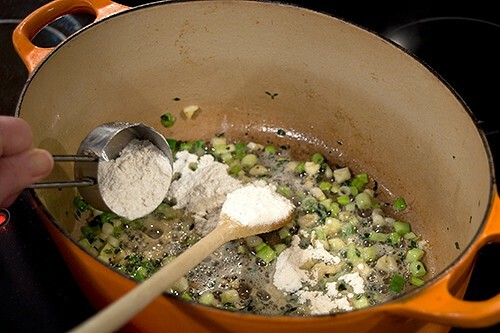 Sprinkle the flour over the onion, thyme, and garlic mixture and continue cooking and stirring for an additional minute. Stir in the milk and stock. Add the bay leaf. Increase the heat to bring the mixture to a boil, then reduce the heat to medium and cook for two minutes. Stir in the salt, black pepper, cayenne pepper. 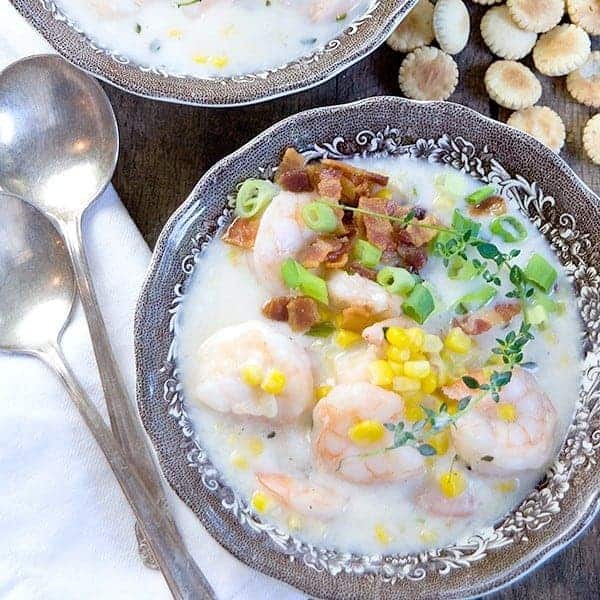 Add the shrimp and corn. Simmer for approximately 4 minutes or until the shrimp are done. Remove and discard the bay leaf. Garnish individual servings with crisp bacon and additional sliced green onions. 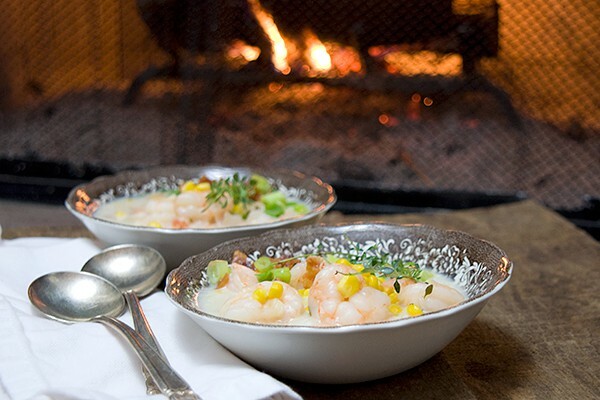 This shrimp and corn chowder is great for a comforting evening by the fire. Cut the bacon crosswise into 1/2-inch pieces. 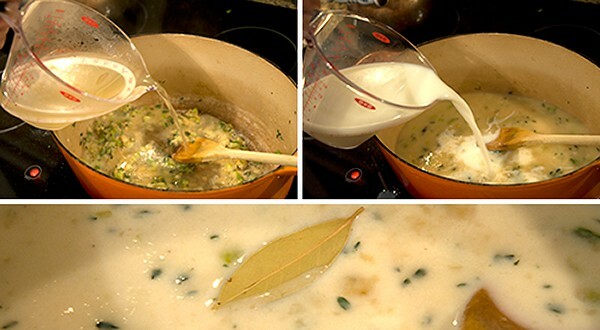 Add to a large saucepan over medium heat and cook until browned and crisp (6-7 minutes). Remove the bacon and set aside. 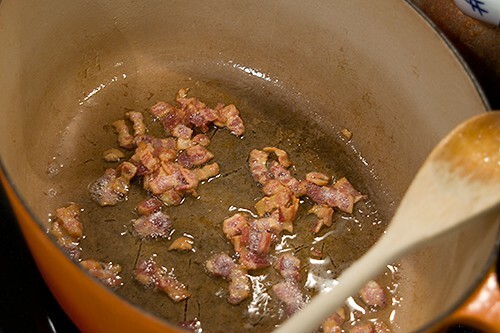 Keep the bacon drippings in the pan. To the bacon drippings, add the green onions, thyme, and garlic. Cook, stirring frequently, until the onions are wilted (approximately 2 minutes). 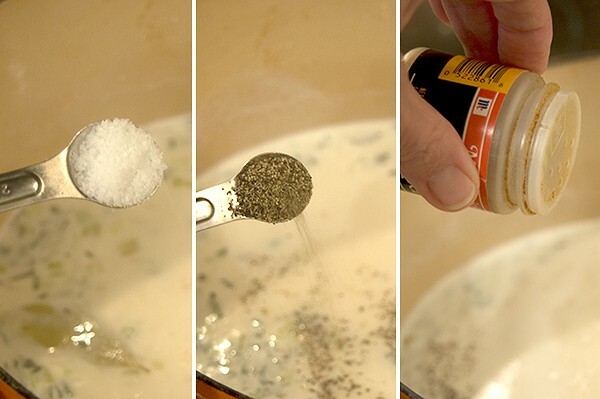 Sprinkle the flour over the onion, thyme, and garlic mixture and continue cooking and stirring for an additional minute. Stir in the milk and stock. Add the bay leaf. Increase the heat to bring the mixture to a boil, then reduce the heat to medium and cook for two minutes. Stir in the salt, black pepper, cayenne pepper, shrimp, and corn. 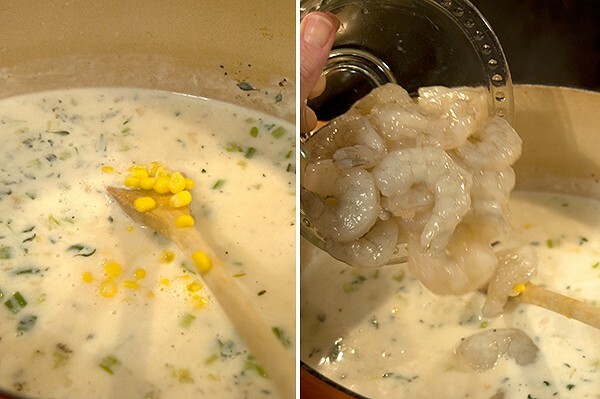 Simmer for approximately four minutes or until the shrimp are done. Remove and discard the bay leaf. Garnish individual servings with crisp bacon and additional sliced green onions.